Korg continue to set demanding standards in the world of electronic digital instruments. Since Korg have exclusively worked on developing digital instruments, particularly keyboards – their investment into perfecting digital technology has given them much needed momentum into setting the standard with their many varied instruments. Korg has become synonymous with great sounding, good value instruments that lead where others like to follow. 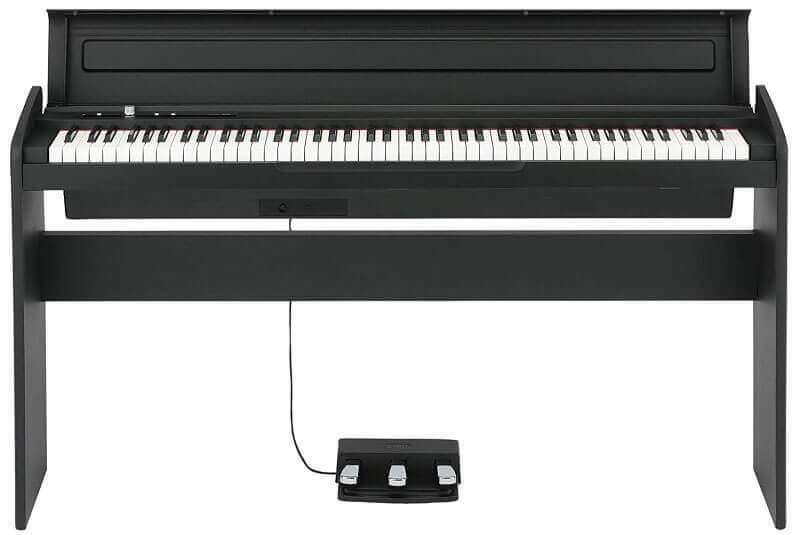 The LP-180 is the entry level budget instrument in a series of digital pianos. Competitively priced, the LP-180 offers forefront digital technology in digital instrumentation without a massive price tag in a compact instrument that would fit snugly into an open corner of even the smallest of living spaces. Korg have invested their engineering skills into the features that matter most – realistic tone production and an even touch response that mimics the feel of a well-constructed acoustic piano. The stereo piano system sound generation technology sets Korg apart in the production of excellent sound. The LP-180 provides a rich piano tone for the instrument which is pretty realistic across the registers and sounds like the real deal. Korg have certainly pioneered great sampling technology in their quest to give even their entry level instruments a high level of authenticity in the sound department. The selecting of any of the other tones available also produce sounds that have a sense of realism and tone complexity which make them sound more natural, rather than digitally manufactured. The tones are clean and full. The keyboard also comes with a set of on-board speakers that deliver a fair amount of sound. The sound remains true on any of the chosen tones and creates a spacious feel in a home environment. With the option of reverb and chorus effects to add to the tone, the spaciousness of the instrument can be increased to add some grandeur to the chosen sound. There is no need for extra amplification unless one is going to use the instrument in a much larger venue. Korg’s natural weighted hammer action keyboard, provides a reasonably well graded response from the low to high end of the keyboard. The lower registers feel decidedly heavier (as they should) compared to the upper end. One wonders though why the better Real Hammer Action keyboard found on higher models isn’t employed across the board. The cost difference between keyboards that do use the upgraded action and those that don’t use this system is not significantly different. One hopes that Korg will dispense with the Natural Hammer action and move into. The instrument itself is housed in a very plain chassis and clearly designed to fit into smaller spaces. As such the instrument feels a little light and players who put some weight into their playing may find the frame a little unstable. The average player though will be more than happy with the feel of an instrument that offers a highly comparable action to that of some great upright pianos and even some grands. Demo Songs: 10 (1 per sound) *Please click SoundCloud button, which is cloud mark in the upper right-hand corner to listen to all songs. The instrument offers a selection of 10 sounds that are well sampled. Each sound has a selection of two effects that have a fixed depth to them. A transpose function is included and the ability to tune the instrument, to match other instruments, is also available. The three pedal attachment unit adds a touch of authenticity to make it feel more like a top end acoustic instrument and the response of the pedals is satisfyingly comparable to that of an acoustic grand. Ten demo songs are available for listening and demonstrate the sounds on the instrument and how they can be used. There are two headphone connections allowing two people to listen at once – great for a teacher-student situation in an environment where a lesson might disturb others. This is a great digital piano if one has an extremely small space available for an instrument. Its narrow straight-line shape gives one a full digital piano that hardly takes up more space than a digital keyboard. Korg are renowned for producing instruments that sound good and this one is no different. It has a clear, rich sound for its acoustic piano sound and the other sounds are quite useable as well, giving players some variation of tone use. The harpsichord is particularly suited for playing some baroque works. The 120 note polyphony means that notes are not lost on more complex passages. It sets quite a high level for polyphony on entry level instruments, which seldom go above 64. The pedal unit, which comes as an attachment on the frame is a three-pedal unit much like that of a grand piano. As such it offers a damper, soft and sostenuto function. Half pedalling is possible on the unit and as such gives an authentic feel to the instrument making more advanced pieces executable in a way that few other digital instruments are able to do. Again these features are often not associated with entry level digital pianos. The graded action, is still one of the best weighted keys mechanisms in the business and Korg have consistently shown their prowess in building keyboards with great engineering. The slim frame, while making it easy to fit into small spaces, gives the instrument a slightly flimsy feel and unstable when playing vigorously. The hammer action mechanism is not the same as that of the next model up. It has a slightly less graded feel than its more expensive counterparts and gives a softer feel than an acoustic piano. The lack of layering functions and split functions limits the use of the other tones, which could have had more expression, particularly with a layering function. This instrument bears incredible similarity to the SP-170S and one wonders why Korg would produce two instruments with such similar looks and feel. You can check out our Korg SP-170S review for more information. 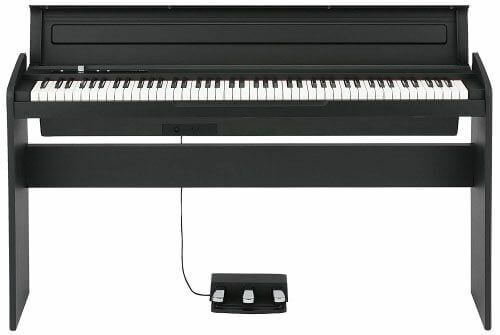 Where the SP-170S has some functions such as layering and splits, the LP-180 has a pedal attachment that gives it more in common with later models from other digital piano brands. It lacks recording functions and also doesn’t allow for layering or splitting the keyboard. This means that the use of the tones available is fairly limited. The strings for example would be far more useful if they could be layered over the piano sound. It also lacks connectors to other devices with no USB or effect pedals inputs. Connectivity is such an important issue with so many devices today that it is quite surprising that Korg have overlooked this detail in the development of this instrument. The LP-180 although sounding great and offering a natural feel to the instrument has a budget feel and look to it. It gives the impression of offering older technology at a cheaper price and so feels a little dated in its response. The fact that the next instrument up in the range offers newer technology and a significantly better feel and sound for only a little extra, almost makes the LP-180 obsolete. This is not to say that it is a bad instrument, only that for a few dollars more, one can get significantly more features. But if cost is to be kept to an absolute minimum and your space consideration is down to the millimetre, the instrument does offer value for money and the instrument will supply many hours of satisfaction. Personally I think Korg would have a much better instrument on their hands if they combined the features of the SP-170S and the LP-180 into one instrument. This would make a formidable entry level instrument that would have very little to compete against it. Perhaps these two models were a test to see what the buying public would be going for in terms of features and hopefully Korg will revise some of the options on what is generally a high a quality option in the digital instrument world.